Richie and Tricia Thomas approached Castle Ring Oak Frame to design and build a large four bay cart shed with a lean to off the back to incorporate dog kennels, wood store and potting shed. The building was part of an ambitious project to landscape the grounds of their historic family home at Pencombe in Herefordshire. Planning permission had already been secured and so we designed a hybrid structural timber frame combining oak and locally grown douglas fir. 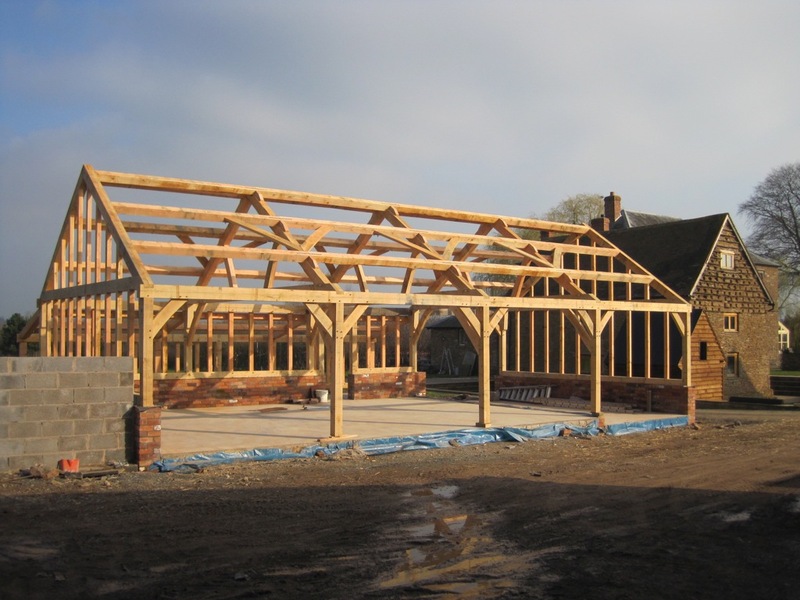 The posts, wall plates, sole plates and tie beams are all in oak, with douglas fir making up the studs, queen post roof trusses and purlins. At Castle Ring we like to joint and peg all of the studs into the main structure – it looks and feels good! Combining oak and douglas fir in this way can offer considerable cost savings. Richie and Tricia run a busy and successful roof sheeting business locally, and asked us to supply and fit the douglas fir weatherboarding but to leave the roof to them. They employed a local groundworks team to prepare the footings and stone walling ready for the timber frame which sits on 3 different levels. Richie and Tricia were busy in the office on raising day and missed the whole thing! It must have been a shock to come home in the evening and find the frame up and finished.